Fortnite’s creative mode – Playgrounds – is back for another limited time. Fortnite’s new limited time mode returns tomorrow, Wednesday July 25, dropping the competitive aspects of Battle Royale and allowing players to team-up and create and build structures in a relatively safe zone. Playground LTM is essentially an open sandbox that increases the number of resources and allows much more time for players to muck around on the island, with no risk of death. As it’s a limited time mode Epic has said you should expect it to change and come back in the coming months with new ideas and tweaks based on community and player feedback. There’s no confirmed end date for the current Playground LTM, but we would expect it to stick around for a week and go back offline on Wednesday August 1. The first thing you need to know is that Playground LTM only supports four players. So essentially, that’s a squad. There’s no danger of other players invading your island and wrecking whatever it is you’re building. While there’s no danger from strangers, friendly fire is turned on for Playground so you can shoot up your buddies. Don’t worry though, players will almost instantly respawn. The other major restriction is that you are limited to playing Playground for 1 hour. After 55 minutes the fatal storm circle will begin to close in, and it will take 5 minutes to do so. If you’re building an impressive structure, you might want to take a screen grab of it before it’s destroyed forever. One other thing – once a player is killed by the storm they will not respawn. With the version 5.10 update, players can now divide into two teams although voice chat will stay on across all four players. And the match will no longer end if one players quits the game. Fortnite Playground is very generous with the resources. There will be 100 Loot Llamas on each island, chest and ammo boxes will spawn 100% of the time and gathering wood, metal and bricks will give you 10 times the usual amount. 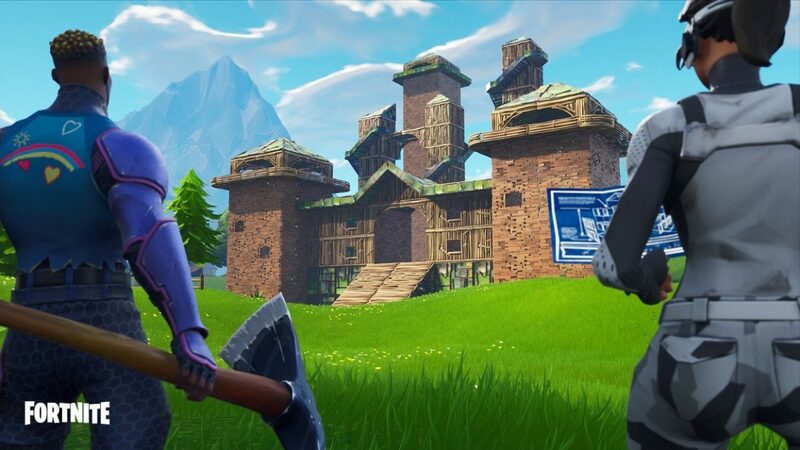 The intention is that you and your squad are free to get creative and build massive structures, whether as practice for Battle Royale games or just to see how far you can push building. With the V5.10 update ATK Golf Karts have been added and spawn 100% of the time and another 100 Supply Drops have been added. If you’re looking to find a Golf Kart here’s a map to all ATK spawn points. All Challenges are turned off in Playground LTM, so you can’t notch up any of the weekly challenges such as following a treasure map, searching the island or wracking up kills in a certain named location. That’s about all you need to know for the new Playground LTM – get out there, build something cool, race some shopping carts, and don’t be shy of sharing it with us in the comments below. Players can now switch teams in-game. Join the same team to work together creatively, join separate teams to practice fighting each other! Note: Voice chat will remain on across all teams, future iterations of the mode will offer more customization. Aim assist will work when using a gamepad against players on an opposing team. Matches will no longer end if one player leaves the server. Golf carts have been added and spawn 100% of the time. Ammo cans spawn 10x the amount of ammo. Removed grey vending machines, increased the chances of higher-tier machines spawning. Lowered forced glider deploy height, so players can get back into the action more quickly. Increased max rocket ammo cap to 60. Increased rocket ammo drop rates. Chests now spawn 3 weapons and more ammo & consumables than normal. The first 24 hours were a bit of a disaster for Playground LTM. It went live for around an hour before being whipped offline for fixing. It’s took a week for Epic Games to fix the problem, and it has warned that there may still be some problems with queues. However, as of the time of writing, the Fortnite Playground LTM is live and working fine.